Learning Prep extends a warm welcome to Karen Makanui, who joined us as our full-time certified Library Media Specialist on Tuesday, October 4th. Karen has ten years experience with Elementary, Middle, and High School levels, including work with learning disabled students. She has a demonstrated track record of innovation, including a past assignment to run a 30-station Technology Room donated to a previous school by Michael Dell. Please join us in welcoming Karen! The greenhouse is open for a visit or a purchase. Come in and see what the students are working on and growing. It has been a successful season for our garden to table program with over 500 lbs. of vegetables harvested and prepared by the Food Service program. During the past three years this program has grown over 1,500 lbs. of vegetables for the school lunches! The nights are cool and the days are warm. Fall is the best time to plant your garden so it is ready for spring enjoyment. Beat the drought and plant your garden with native perennials, hardy plants, and edible perennials from our nursery and greenhouse. Prices range from $2.00 - $5.00. Too many plants and not enough room in your garden? Do you have unique, interesting or tried and true plants that need to be divided? Pot them up and bring them in, and in turn we will give you a perennial plant back. Monday: 8 A.M. - 2:30 P.M.
Friday: 8 A.M. - 2:30 P.M.
Summer is winding down, and we're looking forward to welcoming all new and returning students on Monday, August 29. Parents, if you've not yet completed your registration forms, please click here. We're getting ready for a wonderful year of learning, forming friendships, and growing. See you soon! Now that you’ve finished gathering school supplies, reviewing your child’s fall wardrobe, and seeing summer weather begin to cool down a bit, we need to take a moment to address one of the most important concerns that we all share: safe and timely transportation to and from school. Please take a moment to review our School Transportation Plan below. 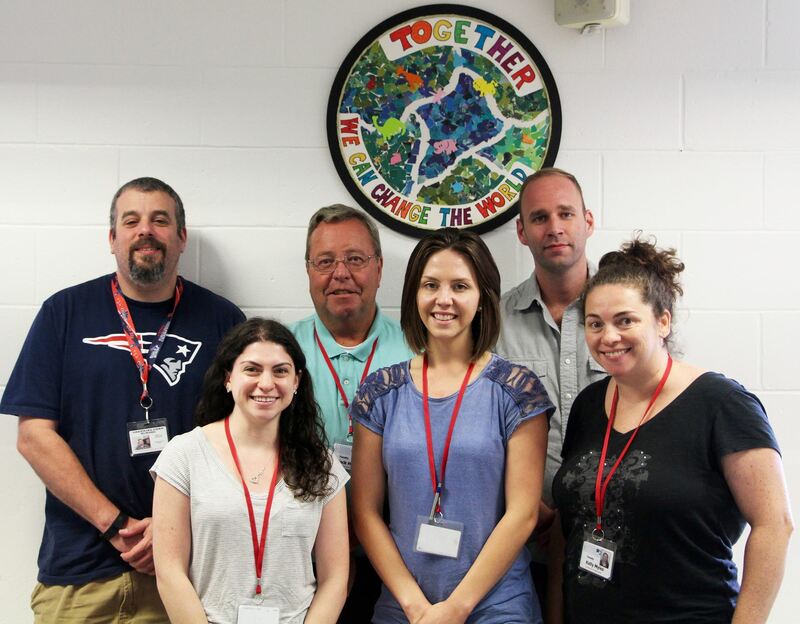 We have been working with those services and dispatch offices over the summer to prepare for the first day of school. With many new drivers starting each year, and all of our students adjusting to school routines, it typically takes about a week to address issues of students arriving home without undue delay. If you or your child experiences an issue with transportation by a commercial bus/cab service, we would like to help. Please call us at x111. When you arrive, simply join the line of vehicles in our back parking lot. Please retain your child in your car until reaching the designated safe drop-off area, where our friendly, welcoming staff will assist you and greet your child. Elementary/Middle School vehicles enter and exit by the greenhouse on Prospect Place and park along the Mass Pike wall or in any empty space in our back lot. Please come to the HS building for sign-out. High School vehicles enter campus at Simms Court from Washington Street (by the funeral home), where staff will guide you around to line up on Allen Place next to the yellow house and arrange for your child to meet you at your car. After your child arrives at your car, please proceed to the exit at Washington and Allen Place. Please note that the funeral home does not permit LPS parking on their lot. Learning Prep School coordinates 150 vehicles in safely transporting students to and from campus each day. We thank you in advance for your support, and we look forward to a wonderful year. Please feel free to call extension x111 with any questions. (L to R) Stephen Zuckoff, having left LPS at the end of the 2014 having taught for six years, Steve returns to teach High School math; Robin Stein - Clinical Fellowship Year; Jack Heavey - High School math; Allison Signore - job coach; Timothy Ryan - Clinical Fellowship Year, and Kelly Myles, High School ELA. A warm welcome to all. Parents, you can access all the past newsletters here. On behalf of our faculty and staff, it is our pleasure to welcome you and your student to Learning Prep. Our past experience has shown us that it takes a team to help all students reach their maximum potential. One of our hallmarks is that we work collaboratively to provide a program where all students can be successful. The caring and dedicated faculty at Learning Prep encourage all students to strive for their personal best. We look forward to watching students grow as they become involved in the Learning Prep community through student leadership, school activities, the farm-to-table initiative, work/study, and clubs. Your involvement, partnership and support are greatly appreciated during the school year as we work to build and maintain our programs.